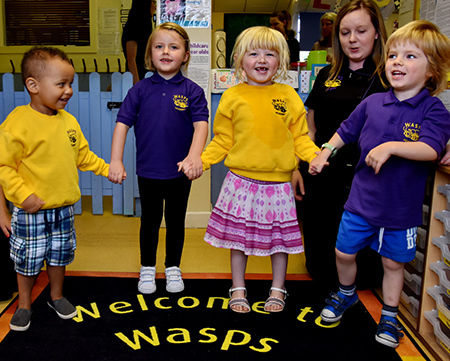 We have two Wasps academies, one in Latchford and the other in Padgate, both provide the perfect environment in which to gradually prepare your child for school life. We have an extensive range of facilities and specialist teaching means that children are encouraged to develop an enthusiasm for learning. From cookery classes to educational games, we offer a wide variety of extra curriculum activities to allow your children to benefit from a breadth of different experiences. Children also have the opportunity to extend their learning through educational visits. All our meals are cooked fresh daily offering nutritious food which is adapted to suit the individual dietary requirements of the children we care for. 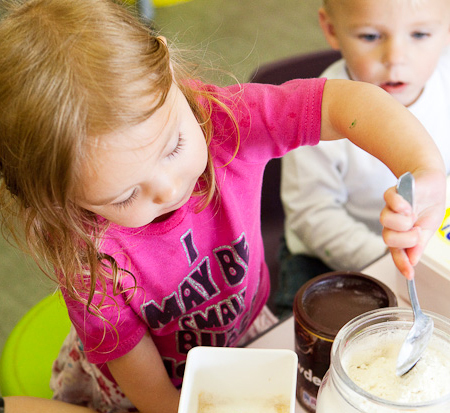 Healthy eating is promoted throughout our nurseries, with all our produce sourced locally. Children attending Wasps Academy can now purchase stylish uniforms in our signature colours of purple and gold. You can place an order with a member of the Wasps Academy team or by completing the following order form.